Does it at least have a low-battery warning? Yes, the LEDs get dimmer. Great. So yet another flawed design. Those AAA cell lights are really annoying. My favorite tail light is the CatEye TL-LD1100 which uses two AA cells. as well are rear pointing LEDs. dim, your battery is low. LOL, that's what I said. where you can't see it? for "it'll be empty very soon". And then the light gets dimmer and dimmer and runs out while on a long ride. power source has its drawbacks. My road bike even has wires inside the tubes. at night. If the light is annoying, do something about it. as you observe. I've done this many times with friends. would make you more visible. jacked-up pickups with high beams, light bars and fog lights glaring. solid flat-proof tires or all the other extreme equipment you call for. How can this be" No lights and no collisions? Can be summed up in one expression: Safety in numbers. human-powered propelling is frowned upon as too stressful and too lowly. So hardly anyone does it and car drivers do not anticipate a cyclist. lot faster in their approach than a pedestrian. How odd. Your 8 Watt daytime running light didn't prevent a near collision. you need to ride in the gutter. What's the street lighting like? run it on the brake surface nstead of the tire. lumen headlight and a tail light. The shop could mark it up to $100. as transportation for use at any time of the day or night. recreational riders, and I'm including students riding to school. NiMH: 1.2V with almost do voltage degradation until fully discharged. not as transportation for use at any time of the day or night. Yes, students must be included because that is clearly commuting. systems I see a slowly increasing number of high school kids use a bike. work at, numerous lunch hour riders but nobody commuted by bike. light, but many are ridiculously weak, 10 lumens, or even less. I don't know if I've seen a StVZO tail light, but I've see a lot that are invisible either by design or because of dying batteries and a lot that are too bright to ride behind at night. Most fall somewhere in between and are plentiful -- from PDW, Lesyne, L&M, etc. The chronically nervous sometimes have two or three tail lights, which is kind of humorous -- unless they're blinding. Again, in sunshine, I always see the jersey first. I ride up behind someone and notice the tail light when I'm five feet away. It's like a fashion accessory. aren't typically wearing highly visible clothes like that. That's fine, and around here, people don't worry. I'm saying if you worry about being seen, be visible. Lights aren't as good as high-viz clothing in daytime. 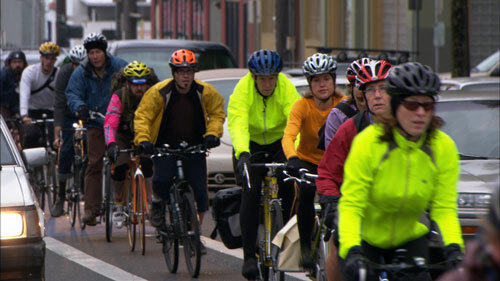 Typical PDX garb: http://deepgreenmovie.com/wp-content...PDX-Bikers.jpg Who is most visible? Note absence of DRLs. candidates had no interest in bicycle infrastructure at all. You need lights to see when it is dark and to be seen when it is dark or overcast, assuming you're not wearing bright clothes. A light is useless on sunny days, except in rare instances with hard dappled light caused by tree canopy or similar conditions generally lacking from inner-cities where all the "transportational" cyclists ride. front by the "fatness" of the lights. tail light when I'm five feet away. It's like a fashion accessory.